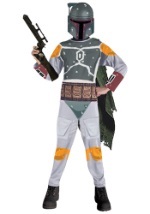 You'll be living the Star Wars saga in this Boba Fett supreme edition costume! Show off your love for the movies in this licensed costume that includes a grey, jumpsuit and a character helmet. The helmet has a see-through visor shaped like a "T" and and attached antenna on the right side. The grey jumpsuit has long sleeves and velcros in the back for closure. Working pockets are located on the thighs and below the knees to keep your ammo in. A light brown shirt is worn over the jumpsuit and is made from foam. A dark green cape is attached to the left shoulder along with Wookie braids. The molded armor pieces are secured in place with durable velcro and have a worn look that include bullet holes. The chest, collar and codpieces are painted green while the shoulder and knee armor are yellow. A brown belt along with an ammo belt wrap around the waist with velcro and brown gauntlets slip on over the wrists. A pair of tubes are attached to the left gauntlet and runs up the arm. The back piece has an attached jet pack that is made from durable plastic and also has a worn look. Be sure to check out our Star Wars accessories for a blaster or a collector's helmet! This product has restrictions that limit the countries that we can ship to. This product cannot be shipped to Albania, Algeria, Angola, Anguilla, Argentina, Armenia, Australia, Bahamas, Bahrain, Bangladesh, Barbados, Belarus, Belize, Bermuda, Bhutan, Bolivia, Plurinational State Of, Brazil, Brunei Darussalam, Canada, Chile, India, Italy, Lithuania, New Caledonia, Pakistan, Philippines, Poland, Samoa, Slovenia, Switzerland, Taiwan, Thailand, Ukraine or Vanuatu.